There's been a part of me that's been putting off this review. It's been on my schedule for a while, but there was a part of me deep down that was dreading this - and at first glimpse, that shouldn't make sense. This is one of the most critically acclaimed records of 2017 thus far, it's racked up comparisons to Sufjan Stevens' Carrie & Lowell and David Bowie's Blackstar and Nick Cave's Skeleton Tree, all records that I love and actually own on vinyl to this day. And I just don't have the same connection that I do with those artists. 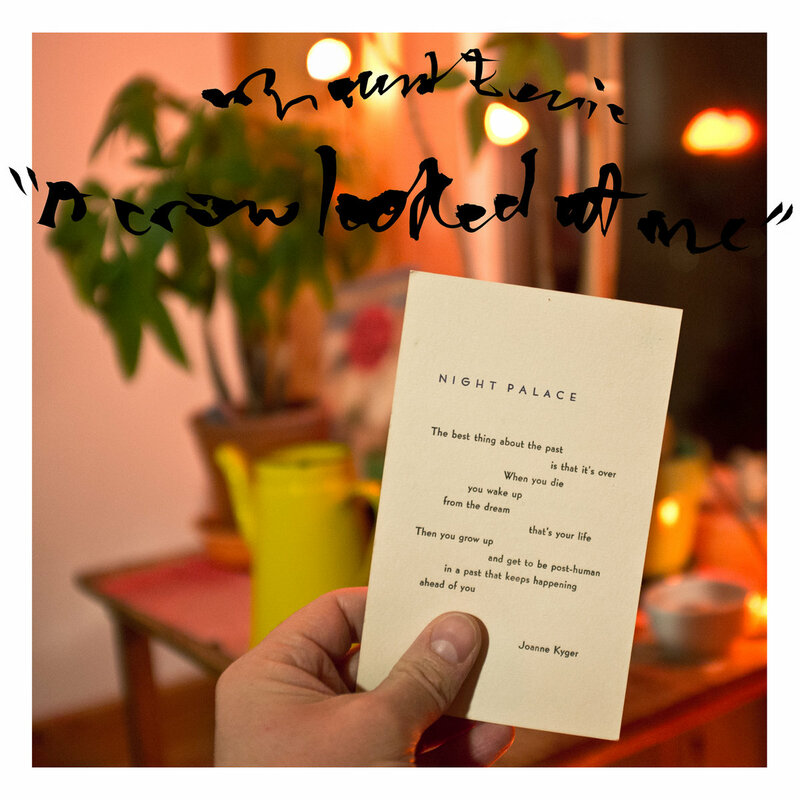 I tried, folks, believe me, that's another reason this review took so long to come out, I listened through his discography over and over and I'm not sure what to tell you, except that Mount Eerie might not just be my thing. I can recognize the quality in the writing which is clever and understated, even if I do find his black metal experiments a little odd because the production never quite clicked for me, especially against his vocals... but it never got deeper than appreciation, I probably wouldn't call myself a fan. As such, when you hear his newest album is a very raw record about dealing with the loss of his wife Genevieve to cancer, I had a feeling like I was walking into a funeral for someone I only vaguely know, and I was genuinely worried I wouldn't feel the impact - all the more disconcerting when again, it's one of the most critically acclaimed records of 2017. But I've stalled long enough - how did A Crow Looked At Me turn out? Well, this is not going to be a traditional review - hell, the more I think about this album the less I think it should have been reviewed, or sold for that matter. And indeed, I think this is going to be one of the stranger pieces I've ever put together, because the more thought I gave A Crow Looked At Me, the more it feels like a decidedly unique entity that really feels impossible to criticize traditionally. And while I will draw comparisons to Carrie & Lowell and Skeleton Tree - because the parallels really are blatant to both records - what this reminded me of most was actually an interview with Bob Dylan surrounding his album Blood On The Tracks in 1975, where he said he didn't relate to people's enjoyment of that record, almost as if it was a record that wasn't meant to be enjoyed. Now let me make this clear, there's a tradition of artists making records that aren't designed to be enjoyed traditionally - I'm fairly certain Lou Reed has done this about four or five times - but there's a difference between baiting the public and doing what Phil Elverum is doing here. Because, on the surface, this is a record that is explicitly processing his grief about the passing of his wife, and it takes you through the reams of complicated emotions that come with it. Anger and denial at nature taking her before her time, the fears that his memories of her will fade and be replaced by the photographs encapsulating still shots of what happened, trying to process her passing as he sorts through her old things and recalls the cancer that was slowly killing her, and finally the necessary solitary journey he must take in order to find some sort of clarity and peace, with a coda that leaves an odd lingering feeling that there's something of his wife that remains... even as the world darkens, something of her still remains, at least for him. And with that sort of arc and poignancy, I completely see why so many people loved this record and were able to connect to it. And there's something to be commended about Elverum's approach to this: an intimate vocal pickup, barebones guitar and piano except for a few hints of sampled deeper fuzz on later tracks, extremely sparse beats, lyrics that feel less like traditional songs and more like spoken word poetry that doesn't care about rhyme or flow, singing that lets every imperfection through, feeling less like a carefully composed project and more like a man sifting through the complicated, often contradictory emotions and thoughts that come after the passing of a loved one. There's almost something artless about it - and that's not an insult, it's a feature, an artist trying to strip away anything that could get in the way of raw human emotion in search of... let's call it truth. But this is still an album - there is still a thematic arc to it, even just through the song sequencing. In fact, it's very much the exact arc that went through Skeleton Tree, down to parallel mentions of a grocery store representing the disconnect with the normal world on 'My Chasm', the venture to pure, inexplicable nature to experience some form of closure on 'Soria Moria', to the feeling of some lingering connection on 'Crow'. Hell, even the writing style feels similar - scattershot, rambling, and while Elverum's storytelling feels much more grounded and detailed and direct, it's playing in the same ballpark. But say what you will about Nick Cave, he never made any pretensions to the fact that there wasn't a degree of artifice to Skeleton Tree, mostly because while the record did touch on his son's death, it was also serving to shatter his narrative fixation on death when confronted with the reality of it, and when you consider Cave's career as a storyteller, that picks up tremendous weight. Elverum, in his own way, is doing the same thing: he's aiming to strip out any glamour or allure to this story - for him, death is now real, and to quote his song called 'Real Death', 'when real death enters the house, all poetry is dumb'... and yet for the rest of the album, he's still writing it. And don't think he's not intensely self-aware about that - he knows what it looks like to be writing these stories which eventually people will lose interest in hearing, how cheap it can feel, and yet it's his only way of coping with this. And if it feels slipshod or clumsy or malformed, it's intentional because in death's wake good art is not made, at least when you strip it down to the core. To quote Pitchfork, 'facts aren't art and art isn't real, at least not the way cancer is'. See why I'm having problems even calling this a review? This is an album that's deconstructing a way out of its flaws and then subverting its excuses for the paltry justifications that they are. It's almost too self-aware for its own good - and yet there's a part of me that feels that it actively works against the raw power of the emotion at its core, building layers of artifice to insulate itself... which, when you think about it, is exactly what coping can be, especially if Elverum is using the artistic process to do it. And for him, I can definitely see this record's value... but for anyone else to hear it? For me, what would be compelling out of this record is whether you can build a connection to what Elverum presents as his barest point... and from a lot of listens, it's not clicking for me. His voice reminds me a fair bit of Sufjan Stevens in that it's pretty unassuming and not traditionally as expressive as Nick Cave was on Skeleton Tree, but compared to the melodic intensities on Carrie & Lowell Elverum's grief can feel numbed and muted - which yes, I know is the point, but it's not like his emotional presence is pulling me into his pain. Same with the barebones melodies and beats, and also with a lot of the poetry - again, I get that's the point and that the writing isn't supposed to read as beautiful or compelling to an audience, filled with the sort of personal details that will matter the most to him and him alone, but when you match it with the performance it's not something I want to revisit or to which I feel any real connection. And that's ultimately the issue: I feel like I'm walking in on a funeral or a therapy session for someone I don't really know. I don't doubt that Elverum probably thought he had to make this record, and for people who can connect with his delivery or his writing or presentation, I get why they will adore this record. And I can appreciate that power... but I'm not feeling it myself. Ironically, when you intentionally try to strip out artifice to get to the core of emotion and then build more to deconstruct your own choice to do that, even if you're doing it unconsciously, it can be emotionally distancing for parts of the audience. But that also means I can't grade this as an album, because every reason it's not compelling for me is not only intentional but thematically justified, even if on some level he loathes that he's doing it. So can I recommend it? Honestly, I have no idea - if anything I just described sounds interesting or potent to you, you'll probably adore this record. For me, though... I'm not giving this record a score, and the more I think about it the more it feels like it would be wrong to do so. After all, Phil Elverum himself called this 'barely music' - and yet sometimes barely is enough. For him, I hope it was.